Product Roundup Stop anyone on the street and ask them for a definition of the term ‘Ultrabook’ and I suspect they will look at you with utter incomprehension. Hardly surprising, since Intel’s effort to create a popular brand for thin’n’light notebooks hasn’t really been a roaring success. 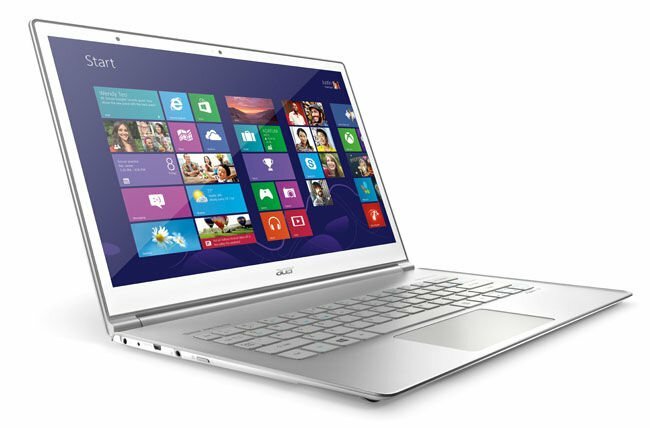 To me, the Ultrabook is the logical evolution of the laptop. I mean, who doesn’t want a notebook that’s lighter, thinner, more powerful and sexier than the one they bought three years ago? The new Ford Fiesta is more economical, more spacious, more comfortable and better equipped than previous models, but that doesn’t make it an ultrahatchback. This is what happens when you let members of the marketing and PR departments out of their cages. So let’s not get bogged down in exactly how thin an ultrabook should be with a given screen size, exactly how fast it boots up, how much it weighs - though curiously this isn’t something Intel seems to have laid down the law on - or exactly how long the battery lasts. Rather let us for a moment just assume you want a thin and reasonably light laptop with a half-decent battery life, a USB 3.0 port or two and, this being the era of Windows 8, perhaps something in the way of a touchscreen. And that you have no use for a built-in optical disc drive. And let us also assume you are not overly concerned about the bump in performance likely to come with Intel’s new Haswell architecture, which will start superseding today’s Ivy Bridge chips later in the year. Unless you only have £350 to spare and just want something mundane made of plastic to permanently sit on your desk that’s surely what most potential notebook buyers want. As a flagship Ultrabook, Acer’s old Aspire S5 left a bit to be desired, but the new S7 is an altogether more impressive bucket of bolts. At just over 12mm thick and with a stylish body made from a combination of toughened Gorilla Glass and aluminium, the S7 should certainly appeal to the aesthetes out there. The design isn’t perfect, though: the underside is bit slippery when resting on your lap and it’s difficult to prise open if you keep your fingernails short. The 13-inch IPS LCD screen offers a 1920 x 1080 resolution and is quite the looker just as long you like your screens glossy. Like most super-thins, there’s only space on the S7 for two USB 3.0 ports. So no Ethernet, though fair play to Acer, it does bundle USB-Ethernet and micro HDMI-VGA adapters along with a very nice sleeve and wireless mouse. A backlit keyboard that’s as lovely to look at as it is to type on, a 128GB SSD and a 1.7-2.6GHz two-core, four-thread Core i5-3317U chip complete this rather impressive and pretty machine. 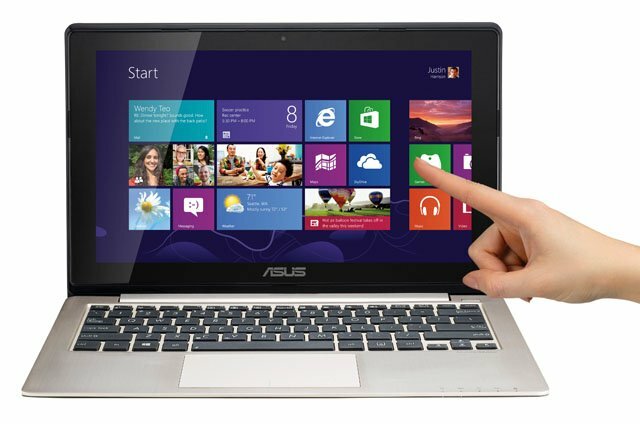 If money and space are tight then Asus’ little 11.6-inch sprog has much to recommend it. For the impecunious there’s a version with Intel’s Pentium 987 Ultra Low Voltage 1.5GHz dual-core processor, though the £450 Core i3-3217U machine will probably prove the better choice. For your money you get a perfectly serviceable and well made little machine that weighs 1.4kg and is no more than 20mm deep. The screen isn’t the brightest you’ll ever see but the touch part works a treat. At this price point you naturally have to forgo a few luxuries. The otherwise fine keyboard has no backlight, the Ethernet socket is only good for 10/100Mbps and the screen makes do with a resolution of only 1366 x 768, though on a panel this size that’s arguably all you need or want. Asus has seen its way to clear to fit one USB 3.0 port alongside two USB 2.0s, and the battery life isn’t half bad either. You should easily get over five hours’ usage between charges. As a budget ultra-ish-book the little Asus has a lot to recommend it.